Author(s): Majid M. Heravi, Department of Chemistry, School of Sciences, Alzahra University, Vanak, Tehran, Iran. Mahdieh Ghavidel, Bahareh Heidari. 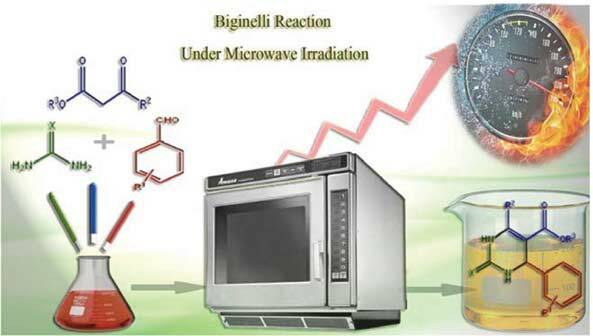 In this review, we tried to highlight the recent advances in the Biginelli reaction, leading to the synthesis of 3,4-dihydropyrimidin-2(1H)-ones, albeit only those conducted under microwave irradiation. The merits and drawbacks of these reactions are compared and discussed with those performed under conventional heating. Dedicated to kazem Kargosha, in the occasion of his honorable retirement as a Professor in Analytical Chemistry. I would like to open this essay by paying homage to Professor Kargosha, who was much inspirational to the establishment of the Iranian Chemical &Chemical Engineering Society (then, Iranian Chemical Society). Keywords: Biginelli reaction, dihydropyrimidines, DHPMs microwave irradiation, brønsted acid, lewis acid, ionic liquid, catalysis, multicomponent reactions, (MCRs). Affiliation:Department of Chemistry, School of Sciences, Alzahra University, Vanak, Tehran, Iran. Keywords:Biginelli reaction, dihydropyrimidines, DHPMs microwave irradiation, brønsted acid, lewis acid, ionic liquid, catalysis, multicomponent reactions, (MCRs). Abstract:In this review, we tried to highlight the recent advances in the Biginelli reaction, leading to the synthesis of 3,4-dihydropyrimidin-2(1H)-ones, albeit only those conducted under microwave irradiation. The merits and drawbacks of these reactions are compared and discussed with those performed under conventional heating.